Happy New Year to all TGS readers. We wish you and your family a happy and prosperous new year. Last year was an awesome year for me personally. We had our 2nd daughter. 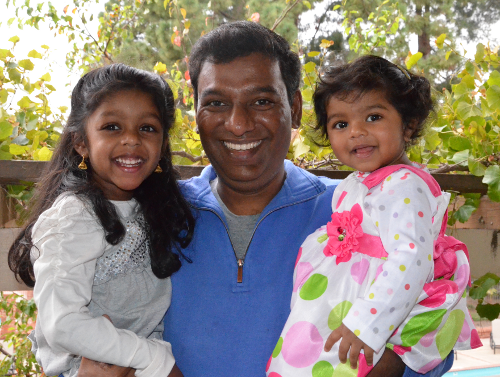 Both our daughters (Diya and Neha) bring so much joy and happiness every day in our family, I feel truely blessed. With your tremendous support and love, last year was the best year for the blog. Currently we have over 50,000+ subscribers. We produced lot of high quality tutorials last year. I also published two books last year–Bash 101 Hacks, Sed and Awk 101 Hacks. I’m very excited for 2012, and extremely committed in producing several high quality tutorials that will educate you on Linux and Open Source Technologies. I appreciate all the support given by the regular readers of the blog. I’m very grateful to have you as part of the TGS blog. Happy New Year to you too Ramesh. And your beautiful (and growing!) family. I wish you and your family a happy and prosperous year 2012. Your articles had been very helpful in my professional life. Keep doing the good work. HAPPY NEW YEARS TO YOU RAMESH. AND GOD BLESS YOU. Happy New Year Ramesh, to you and your beautiful familiy. Happy New Year 2012 to you and your two stars also and your wife too…. happy family life, HAPPY NEW YEAR 2012. Happy new year to your too. Very good work in thegeekstuf. Happy new year & all the best! Wishing you happiness, health, and success in the coming year, to both you and your beautiful family! I deeply appreciate your thorough and concise website–a tip-top source of information for anyone eager to make personal or professional progress on linux and open-source! Ramesh, Wish you a happy and prosperous 2012. I have been benefited with your articles. Thanks a ton. Wishing you a Happy and Prosperous Productive New Year. Nice to see you with kids. Your site is very informative and helpful for all techies. Those two angels are not only your daughters, they are your mothers too. They are so precious and Please take care of them with love and attention. Beautiful girls – you have every right to be proud!!! Happy New Year to you and your beautiful Family !!! Wish You a Happy and Prosperous New Year to You and Your Family……. Happy New and Thanx for all the nice tutorials. wish you a wonderful year Ramesh. Hi, wish you a very happy new year. Wish him best of luck for all of your dreams. Your tutorials on the open source are very good with detailed explanation. Looking forward to continue your effort, we readers enjoy the same. Happy New Year to you and your lovely family! I am from Ethiopia and I find your articles very helpful, precise and to the point all the time. I really appreciate your hard work. Please keep it up!! I expect to read more of your articles in this new year. Happy New year to you Ramesh!!! God bless you and your family!! Hope you achieve greater Success this year!! That so very beautiful picture! Happy New Year from Argentina Rosario. And thank you so much for another year full of excellent tutorials. Happy new year Ramesh !!! Both of them are cute … Nice Click ! A Blessed, Wonderful, Happy,Healthy & ProsperousYear Ahead….. Wish you and your family very very Happy, Healthy & Prosperous New Year 2012…!!! For you ang for your family. I want to thank you for all the knowledge I learned from reading your blog. Happy New Year Buddy .. Wish You and Your Family an AweSome New Year 2012 .. Kids are Very Cute Ramesh 🙂 Kids make Life Colorful. Enjoy. Wish you a very happy and prosperous new year to you and your family !! I really want to thank you for the knowledge that you have shared with us. Looking forward to further read interesting tutorials from you. Tho’ it is late, Wish you a Happy New year and continue your good work. what a nice picture- thanks for sharing!